The library will be featuring a video installation of “Hudson: Through the Lens of Djelloul Marbrook” viewable at the back of the library where the History Room is located from December 1, 2017 through January 31, 2018. 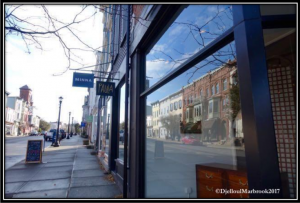 Djelloul Marbrook, poet and local resident, has been photographing Hudson and observing its architecture, people and transformations for years and he has gathered a collection of these photos for viewing. Djelloul Marbrook’s Far from Algiers (2008, Kent State University Press) won the 2007 Wick Prize and the 2010 International Book Award for poetry. He also won the 2008 Literal Latté fiction award and four honorable mentions in fiction from New Millennium Writings. He is the author of six books of poems and six of fiction, and four more books of poems and three of fiction are forthcoming in 2018. His poems have been widely published in such journals as American Poetry Review and Barrow Street and collections such as New Millennium’s 2017 anthology, Red Sky (the 2016 Sable Books anthology about violence against women), and Dove Tales, the 2016 Writing for Peace anthology. A retired newspaper reporter and editor and a U.S. Navy veteran, he grew up in New York and lives in Germantown with his wife Marilyn. He maintains a lively presence on Facebook and Twitter. Many of his poetry books are available at the library. This installation will be on display through December and is viewable during library open hours and wheelchair accessible. For more information email programs@hudsonarealibrary.org, call 518.828.1792 x101, or visit the main desk in the library. This entry was posted in History Room, News, Programs and tagged Djelloul Marbrook, history room, Video Installation by smcintosh. Bookmark the permalink.